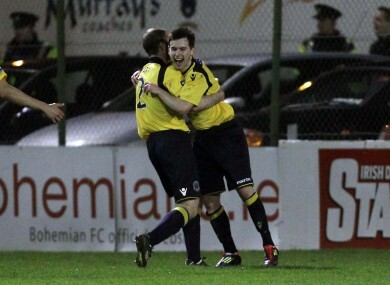 Karl Moore (right) celebrates his goal with Bohs captain Owen Heary. A THUNDEROUS STRIKE by new recruit Karl Moore gave Bohemians a 2-1 win over Portadown in the first leg of their Setanta Sports Cup first round tie. Moore marked his first competitive appearance since his switch from Shamrock Rovers with a stunning left-footed shot which put Bohs 2-0 up in the 57th minute. Former Drogheda United man Dinny Corcoran gave the hosts the lead on the stroke of half-time when he latched on to Craig Sexton’s long clearance to score. But Bohs’ advantage was halved on the hour mark by Kevin Braniff, leaving the tie finely poised ahead of next Monday’s return leg in Armagh. “I’m delighted with the result. I’m delighted with the performance of the squad,” manager Aaron Callaghan told BohsTV afterwards. I thought we tired in the last 15 or 20 minutes in the game, but that was to be expected. I think the majority of those players were playing their first 90 minutes in our pre-season, but the result was fantastic for the club. In the evening’s other first round tie, St Patrick’s Athletic lost 1-0 to Cliftonville. Northern Ireland international Liam Boyce scored the game’s only goal in the 48th minute, leaving Pat’s with it all to do in Inchicore next week. Polish trialist Dawid Janczyk scored last night as Limerick FC lost 3-2 to Sligo Rovers in a pre-season friendly in Terryland Park. A first-half brace from Raffaele Cretaro and a goal from Alan Keane saw Sligo come from behind to win after Derek O’Brien gave Lims the lead in the 7th minute. Email “Moore of that, please: Karl gives Bohs Setanta advantage”. Feedback on “Moore of that, please: Karl gives Bohs Setanta advantage”.